Fast-paced, practical, and innovative, this text for pre-service and in-service teachers features clear, easily accessible lessons and professional development activities to improve the delivery of academic language/literacy education across the content areas in junior/middle school and high school classrooms. Numerous hands-on tools and techniques demonstrate the effectiveness of content-area instruction for students in a wide variety of school settings, particularly English language learners, struggling readers, and other special populations of students. 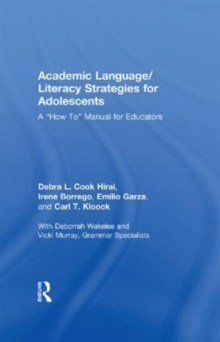 Based on a strong professional development model the authors have been instrumental in designing, Academic Language/Literacy Strategies for Adolescents addresses: motivationattributes of academic languagevocabulary: theory and practicereading skills developmentgrammar and writing. A wealth of charts, graphs, and lesson plans give clear examples of academic language/literacy strategies in action. The appendices - a key component of the practical applications developed in the text - include a glossary, exemplary lessons that address key content areas, and a Grammar Handbook. In this era of increased accountability, coupled with rapid demographic change and challenges to traditional curricula and pedagogical methods, educators will find this book to be a great resource.